What material is best for implants – zirconia or titanium implants? Zirconia is better for cosmetics (no gray metal) and people who have allergies and biocompatibility issues. Titanium is better for full mouth implant cases and people who clench their teeth a lot. Needless to say there are many advantages of zirconia dental implants. Dr. Adams is a dentist who places zirconia implants located in Burtonsville Maryland. Are you searching for zirconia implants near me or a ceramic implant dentist, look no further? We are a dentist office that does lots of metal free implants, but we also place titanium when it is a better option. Isn’t one better than the other? Zirconia vs Titanium Implants: What Type of Material is Best? Over the years, not all ceramic implant reviews have been good. Dr. Adams is very excited about some of the new zironia implant products out on the market. He believes some of the new advancements in 2019 have made zirconia and ceramic just as good as their titanium metal counterparts in most cases. Dr Adams stresses that with material differences, zirconia vs titanium, the needs of each patients case should be evaluated. Certain cases will favor one material over the other and the pros and cons of both materials needs to be weighed with each and every case. In cases where there are allergies and sensitivities, zirconia implants are the better choice because they are more biocompatible. In cases where teeth are small and there are a lot of TMJ clenching forces, titanium may be a better choice. Ceramic implant design vs titanium. Considerations other than material differences exist too. 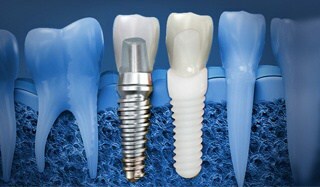 Implants come in different shapes and sizes and these differences need to be considered as well as the material itself. Dr Adams is one of the best dentists in determining what type of implant is best in a given situation. All dental implant options are on the table as we have both titanium and ceramic choices. Non-metal implants have a unique advantage over titanium implants in cases where: 1) showing metal may be a problem 2) patient metal allergies may be an issue 3) the patient has other metals present in there mouth such as silver fillings and metal crowns. Zirconia implants are sometimes called ceramic implants or cosmetic dental implants. Ceramic vs Zirconia – What is the Difference? There is no difference. Zirconia is a specific ceramic. All ceramic implants are made of zirconia, so for implants they are synonymous. Ceramic is a more familiar word for most people, so it has been used more in the past. Now that zirconia is developing a more household name, it is becoming more used than ceramic. Dr Adams practices Zirconia Implant Dentistry in Maryland DC metro area in Burtonsville near Silver Spring, Clarksville and Columbia. Dr Adams sees patients from Maryland, DC, Virginia, across the USA and abroad. Dr. Adams has successfully placed thousands of implants. He is also a consultant and speaker for the zirconia implant company, Zeramex. Zeramex is the leading manufacturer of zirconia implants in the world and is based out of Switzerland. Dr. Adams does cases involving one up to a full mouth of implants. Dr. Adams performs implant surgery and fits implant teeth. Why are Zirconia implants better than titanium? Zirconia implants are tooth colored as opposed to a metal color of all conventional titanium implants. Metal free zirconia implants pose many advantages over titanium. First, since zirconia implants are white you will never see any metal color by the gum-line when you smile. Since zirconia does not conduct electricity or react electronically, it will never react with other metals in your mouth. Metal things in your mouth all have an electronic charge. things such as silver amalgam fillings, metal crowns, braces, titanium implants, partial dentures. The issue with different metals is they react with one another in a reaction called a Galvanic reaction. During these reactions, there is corrosion, flow of electricity and magnetism. All these reactions are not good for the immune system or nervous system. Why is Titanium better than Zirconia Implants? First, Titanium implants cost less and are easier for the dentist to use. Titanium are less likely to fracture than zirconia implants. That being said, I have never seen a zirconia implant fracture. in fact, I have been using zirconia on the biting surfaces of teeth as a crown material for over 10 years. I have only seen a couple zirconia crowns break. However that being written, zirconia is more likely to fracture than titanium implants. Titanium implants have much better parts to use to put teeth on top of implants. Titanium is much easier to use when it comes to multi-teeth implant cases such as all on 4 implants and implant dentures. As stated above, titanium implants are easier to use for the implant dentist. Zirconia implant dentists need additional training and need to be more experienced to place zirconia implants vs titanium implants. Just because something costs less and is easier to do, does not mean it is the best solution. Ceramic Implant Cost? How much is a Zirconia Implant? Ceramic is really not much different in cost than titanium when it comes to tooth replacement. To replace a tooth with a zirconia implant vs titanium, the zirconia implant is 10% more expensive. There are several zirconia implant manufacturers with FDA approval: Ceraroot, Z Systems, Zeramex, Nobel Biocare and Straumann. Nobel Biocare is the most recent newcomer to the market with the Nobel Pearl zirconia implant. The Million Dollar Question: Is Zirconia a metal? No. A metal is a material that conducts electricity. In fact zirconia, if anything is an insulator or a material that has everything but metallic properties. Think of wires with a plastic coating. The wire is always a metal or a material that conducts electricity well and the plastic coating is an “insulator” that keeps electronic current inside the wire and does not allow the electricity to escape. Zirconia being an excellent insulator, is quite the exact opposite of a metal. The non-conductivity of zirconia is exactly what helps it perform well in biologic systems because it does not corrode or react with a water based biologic system. After all, we are nearly 100% water anyway and we all know metal rusts or corrodes. It also helps that zirconia is white and looks better too. Zirconia dental implants are an invaluable asset to the zirconia implant dentist and natural holistic dentistry in general. What is all the hype with metal free ceramic implants? The cosmetic advantages of ceramic implants are obvious. It is a lot easier for an ceramic implant dentist to make a case look natural if the material used is the same color as a natural tooth. Nothing causes a dentist more anxiety than trying to hide unsightly metal in the cosmetic teeth zone. Zirconia is more biocompatible, but why? It comes down to how ones body reacts to different materials. The body always has a reaction to everything be it good or bad. For example, foods. Some people are allergic to peanuts and some are not. Peanuts can be so reactive that eating peanuts can be grave for some people. For other people peanuts pose no problem and in fact have some health benefits. Clearly peanuts have the potential to be more reactive than celery. Likewise with dental materials, some materials are more reactive than others. It just so happens that titanium dental implants are more reactive biologically than zirconia. Naturally, zirconia implants have immunological advantages over titanium. Ceramic dental implants are hypoallergenic. Some cases of titanium sensitivity show up years after surgery when itchiness and inflammation develop around implant sites. It’s a perfect setup for bone loss and the potential failure of an implant. Today, there’s a growing number of people with allergies, sensitivities and immune system problems; therefore implantation of tooth root devices should be seriously considered. Especially since long term exposure to sensitive materials can lead to chronic systemic inflammation and autoimmune diseases such as Hashimoto’s, Lupus, Periodontal disease among many others. The removal of implants from jaw bone is not a simple procedure either. No question, the demand for zirconia implant dentists will be on the rise. People with thin gums and who are susceptible to gum recession may end up with gray metallic-looking gums or titanium showing around the margin of the crown. Since zirconia is non-metallic and white, it is much more natural looking. Zirconia has been referred to as the natural dental implant. It’s a perfect base color that closely mimics what nature created in the first place. Tooth-colored materials makes cosmetic implant dentistry a lot easier. Ceramic does not corrode and it will not conduct electricity or heat. As a bio inert material, it will never break-down and migrate to other sites in the body or interfere with the maintenance of optimal health. Zirconia does not conduct electricity – a huge benefit for the non-metal implant dentist. Bacterial growth on the surface of ceramic implants is far less likely than titanium due to it’s non-conductivity. Metal conductivity and corrosion promotes bacterial growth and increases the chances of peri-implantitis around titanium vs zirconia. Research shows healthier gums around zirconia dental implants relative to metal including titanium and other metal restorative materials. Zirconia implants are the perfect choice for tooth replacement for people with cosmetic concerns and material sensitivity issues. Ceramic does not interfere with the movement of energy though the body’s meridians. Because zirconia is electronically neutral, it has a smaller impact on the meridians than metallic materials. it is an ideal material for tooth replacement for people who want holistic and biological implant treatments. Issues of ceramic vs titanium implants needs to be further explored as do issues of root canals vs zirconia implants. While the corrosive properties of titanium implants has been established, we will need to see how this impacts long-term titanium implant success and if it is a true cause or risk factor in titanium implant failure. There has been a big evolution of zirconia implants. We Currently use Zeramex zirconia implants due to their high rate of success, ease of use, biocompatibility and it is white and non-metallic properties. Zirconia implants can be used in implant bridges, single implant cases and select full mouth implant cases. Ceramic implants are not ideal for all on four dental implants cases. Is there a such thing as a Zirconia Implant Specialist? Zirconia Implants are definitely placed differently than titanium implants. The crowns are also fitted differently than titanium. The bite needs to be adjusted differently than titanium too. It is advisable to seek a dentist who has experience in placing ceramic Implants and not just any implant dentist. Is performing Zirconia Implant Surgery any Different than Titanium Implant Surgery? There is definitely a difference between the training for ceramic and titanium implant dentistry. 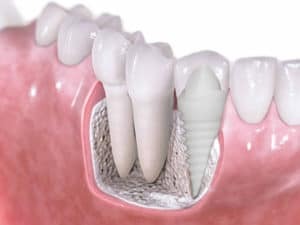 Zirconia implant dentistry is more specialized and most zirconia implant dentists have placed hundreds if not thousands of titanium implants before doing ceramic. 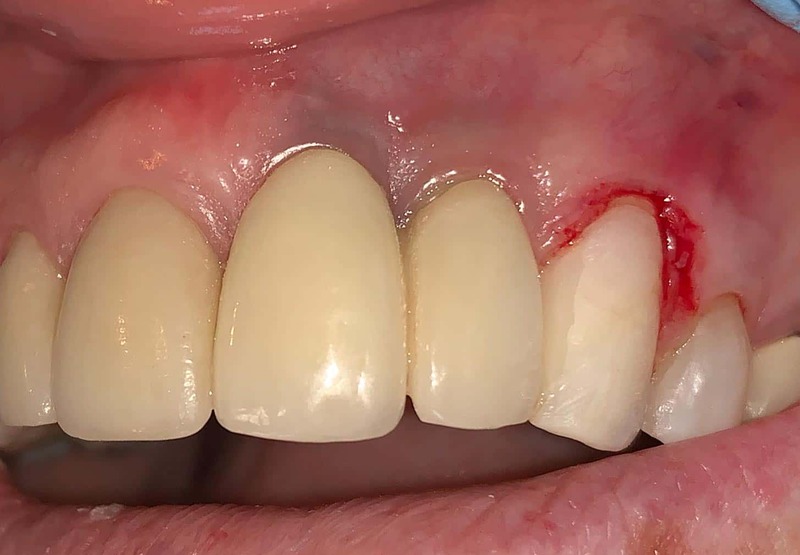 In fact, until zirconia protocols become easier, dentists should get acclimated to titanium prior to doing more difficult zirconia implant dentistry cases.